He will command peace to the nations. I’ve been looking forward to reading a certain book for a while, now that I’ve had some friends recommend it to me. 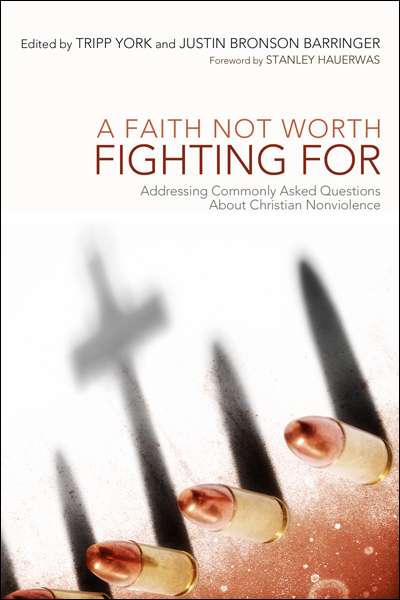 The book is called A Faith Not Worth Fighting For, a collection of essays about Christian nonviolence. It is a book that I already know will challenge me, will set the voice of scripture up against some things people sometimes tell me who also read that scripture a lot. I’d like to thank Carl Jenkins for really getting me interested in the reading, and for giving me bits and pieces of his reading along the way. He did a book review. I’m doing a full chapter-by-chapter throughout the next month or so. Says Stanley Hauerwas in his Foreword to the book, “a commitment to Christian nonviolence is not so much a position but rather a declaration that requires ongoing reflection.” It’s not about posturing a thing but about committing yourself to peace as Jesus taught and lived it. The book draws from John Howard Yoder’s famous work, The Politics of Jesus, which is not a book about where Jesus stands on issues, but rather an affirmation that Jesus was very political and that the way he carried out his Gospel in relation to the politics of the world was nonviolent, yet idealistically dangerous to any earthly kingdom. This was part of why he was executed. He was a “model of radical political action.” Virtually everything he said challenged worldly ways, specifically the ways in which the religious of his day was acting too much like the world. This shook things up. And he didn’t seek control or power, nor did he use violence. And his followers followed in his steps. “The cross,” said Yoder, is not just a mere “ritually prescribed instrument of propitiation,” but a radical “alternative to insurrection [violence] and quietism [passivity].” By refusing to earn his kingdom by force or to not establish it, Jesus chose the cross. We’re called to carry it. The Gospel is politically relevant, always has been, so much so that even when it posed no physical, mortal threat to the rulers of Jesus’ time, they still sought to kill him to preserve their power structures. They failed, not because he overthrew them, but because he overthrew death, the death they put him through. The cross was “the political, legally-to-be-expected clash with the powers ruling his society,” and he did not reject submitting to it. The cross is not just a thing Jesus did so we could have the kingdom, it is what the kingdom is about, what the kingdom must endure. “The suffering Messiah is the inauguration of the kingdom,” says Yoder. The death and resurrection is the first act that sets the tone for our faith. In this faith Jesus showed us, “servanthood replaces dominion, forgiveness absorbs hostility.” To wear Jesus, we must accept these truths. “The voluntary subjection of the church is the witness to the world,” he says, in contrast with the widespread contemporary belief that the church’s witness to the world is America’s greatness that has no connection to yet somehow justifies the violent means our nation has used to gain her power. Are we defending the faith? Or are we defending a system of privilege we think our faith has earned us? Let’s continue to ask that question. This glimpse of Yoder’s book will help us begin our journey into A Faith Not Worth Fighting For. I invite you to go on this journey with me. We will look at this book, and at scripture, and at what voices tell us from here to there. We will weigh things. If you follow my blog or subscribe you can stay updated, or just check the blog weekly. This entry was posted in Books, Faith, Peace and tagged A faith not worth fighting for, Christians, claiborne, faith, fighting, hauerwas, john howard yoder, just war, justin bronson barringer, peace, stanley hauerwas, the politics of Jesus, tripp york, Violence, war, yoder. Bookmark the permalink. Sorry, I have not read your posts reviewing this book. From your introduction, it looks like it is exactly the thing most Christians need today. In a summary: Christ calls us to complete pacifism. I’m so encouraged that you are sharing this message.